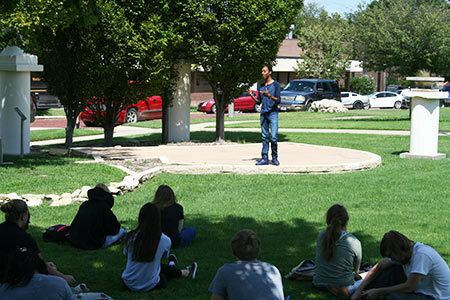 Enjoying a beautiful day on Cowley College’s main campus in Arkansas City, students in Cowley College’s Creative Writing class presented original works as part of the Lines & Lyrics event held Friday at the Calder-Bonfy Amphitheatre. Marlys Cervantes, Cowley College’s Creative Writing Program Director, was pleased with the turnout for the first Lines and Lyrics event of the semester. “I am proud of the students and hope to have even more come out for the event in October,” Cervantes said. Each of Friday’s presenters were first year students at Cowley College. Pictured is Cowley freshman Gimmill Grace.